February sees the launch of our annual vaccine amnesty sponsored by MSD Animal Health. Throughout the amnesty you can now have the second vaccination of the primary course free of charge. The first vaccination must be completed by 31st March 2019. A visit charge will still apply unless carried out within the zone system. To take advantage of the vaccine amnesty scheme please call the office on 01535 602988 to book. On Thursday 28th February we will be holding another Laser Sarcoid Removal Clinic at the practice. Sarcoids are common skin tumours of horses that com in various types and sizes. It is important to monitor sarcoids for any changes in shape or growth, particularly in certain areas. 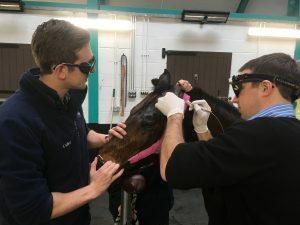 If you think your horse would benefit from the above treatment, or you would like to discuss this treatment further please call the practice to speak to one our large animal vets. Aireworth Vets are part of MSD Animal Health’s Yard Excellence Scheme. 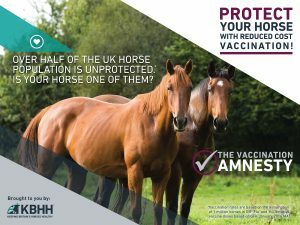 This is in conjunction with Keep Britain’s Horses Healthy, a campaign designed to help minimise illness and disease in the 1 million horses we have throughout Britain. We are encouraging yard owners to become part of this scheme. You can do this by contacting the practice whereby we will organise for one of our vets to attend your yard to assess a series of criteria such as vaccinations, worming, bio-security, isolation procedures etc. The Vet will then put together a report with elements to work on and advice on how to improve your procedures. Our aim is to achieve an environment with happy horses, happy owners and excellent yard reputations which will be reviewed over time. There is no charge for being part of this and we do not charge for any visit or time in conjunction with this. Throughout the year there may be offers for yard owners involved in the scheme. For further information or if as a yard owner you would like to book in please contact the practice on 01535 602988.